And while it’s a phenomenal way to back up files and work with ease and convenience without relying on hardware and worrying about hardware failure, the very fact that we’re saving our files in that big cloud in the sky called cyberspace can make anyone feel on edge! It’s about organization. Social media has exploded for businesses. You have any idea just how much is out there in terms of cloud computing? 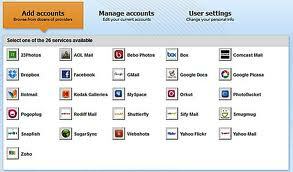 Google+, Facebook, LinkedIn, WordPress, Blogger, Twitter, Tumblr, SugarSync, Access Box, Flickr, and a couple dozen more other services out there utilizing “space” for storage of documents and files. 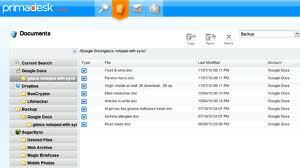 Oh, and of course Microsoft SkyDrive and Google Drive, the premium services for cloud computing. What happens when you have accounts for a ton of these? You’ve got a lot of content out there. But how can a business manage that? Sure, maybe the auto attendant or call center from Planet Perfect can do the job, but let’s face it: it’s still just a bit tough to get it all done. Okay, so you know I don’t like to give the five’ers much at all. But I’ve got to be honest: this app deserves it. Primadesk is a phone and tablet app designed to keep all your content organized. A business COO or CEO out there can search for content, view it, manage it, and even back up the files right on this little app without having to open up a ton of windows, log in a ton of different accounts to manage all of it, or even market that content and sync it with everything else. This is an app that literally does it all for you. And to make it even better? This current beta release is free. No subscriptions, no fees, nothing. Primadesk acts like a search engine, basically. Small businesses spending about a half hour or so looking for specific content in a database for WordPress could find it literally in a minute or two by typing in the keywords; and Primadesk will simply search all the online accounts and social media accounts established with the app, and pull the content up for you. You can even sync your e-mail accounts with it! Gmail, Hotmail, Yahoo, anything. It’s really sickening how easy it is. The app can provide marketers and advertisers and digital gurus the ability to drag and drop files from one place to another — you’ve got a photo you want to “copy” from Flickr to Facebook? No problem. Simply drag and drop it. There’s no getting on Flickr, searching for the photo, and then clicking on the share link. So while it’s free, guess what: you can get even more advanced features as long as you’re willing to pay a monthly charge. That remains to be seen what the cost will be or what the features will be, but it’s been stipulated that the charge may be around the $5 range. Not too shabby. It’s definitely worth it. Great — So Are There Any Downsides? (Sigh) ….This is so hard! You want to bash apps as much as possible with as much snark as you can muster as a reviewer, and then you get stymied with this space-age app from Mount Olympus kissed by the lips of Zeus himself. Not fair! Why do you think I have it five stars? There’s really nothing out there. However…. All I can say is that this is only the beginning. It’s in beta stage at the moment. So there’s always room for bugs, problems, updates, compatibility issues, you name it. This is the norm for any app out there. However, this downside will fall on the developers’ capacity to rectify such problems expediently, because in this day and age, expediency is a deal-breaker. If the developers want to stay ahead of the game for corporations vying for convenience in cloud computing, improvements are necessary. One of the things Primadesk can’t do quite yet is add something called metadata to content, something you can’t traditionally do automatically on Flickr or Facebook. If that could be a possibility in the future, Primadesk will be sitting on the throne for a very long time. 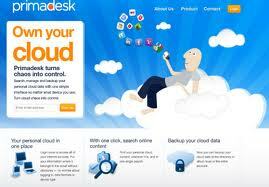 Will Primadesk remain to be the king, the cornerstone of cloud computing? Will everyone have this app on a device, handling all their cloud content with a couple button pushes? Only time will tell. Technology has a way of jumping from behind and tickling our love handles with new surprises. I do not jest. What do you think about Primadesk? Thoughts, questions, comments. The floor is open for questions. Let’s just hope Zeus doesn’t throw any thunderbolts for fun. I’d like to stay not crispy. This entry was posted in Android Apps, Halloo, iOS Apps, iPad Apps, Phone Apps, Small Business, Virtual Office and tagged Blogger, blogs, cloud computing, Google Drive, online content, Primadesk, SkyDrive, Wordpress by Pierre. Bookmark the permalink. Is it a secured app? heard horror stories about apps and services that been compromised.